On October 17, Professor CheongSoonKeng, Dean of University Tunku Abdul Rahman(UTAR) and Dr. Te Kian Keong, Director of School of Medicine UTAR visited our hospital. 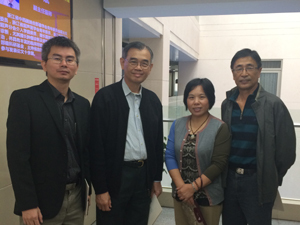 The administrative officials of International Education College of Zhejiang Chinese Medical University and International Communication & Collaboration Center of Zhejiang Provincial Hospital of TCM accompanied their visit. UTAR is a comprehensive university which was found in 2002. School of Medical & Health Science was found in 2009, the main subjects are TCM specialty, western medical specialty, physiotherapy specialty and nursing specialty. There are over 1000 educational faculty and students in the school, 130 of them are majoring in Traditional Chinese Medicine. It is a 5-year full time program, aims to cultivate Chinese medicine multiple-hand clinical practitioners, which means students have to learn Acupuncture, Tuina and Chinese herbal medicines in the five years, after then become specialists of all Chinese medicine therapies. 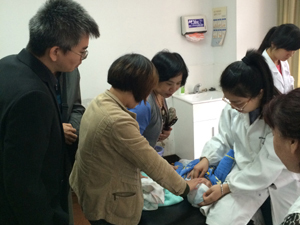 Guided by staff of International Communication & Collaboration Center of Zhejiang Provincial Hospital of TCM, the guests visited outpatient clinics of acupuncture, tuina, Chinese Medicine, and inpatient wards of acupuncture and Tuina, Notable TCM Physicians' workshops and herbs pharmacy. During the visit, Prof Cheong and Dr. Zheng had interviewed our native undergraduates, checked their study plans, training schedules and note books. Our undergraduates'standard professional training had left guests a deep impression. They had expressed strong interesting to send their students to our hospital for clinical training too, and hope to have same standard training like our native TCM students. There for, UTAR and our hospital are going to have further discussion for establishing long tern collaboration, intend to take our hospital as their school's major clinical training base in China.